awesome-cl | A curated list of awesome Common Lisp frameworks, libraries and other shiny stuff. A curated list of awesome Common Lisp libraries. For awesome software, see lisp-lang.org’s success stories and the awesome-cl-software list. All libraries listed here are available from Quicklisp unless stated otherwise. The ones marked with a :star: are so widespread and solid that they became community standards. You can’t be wrong with them. This is the case for Quicklisp, BordeauxThreads and such. Libraries denoted with a 👍 are the ones we like and want to promote here at the Awesome-cl list. They proved solid, they may solve a problem better than a community standard but they aren’t as widespread, or not considered as stable. For example, we prefer Spinneret over Cl-Who. Add something new! See the contributing section for adding something to the list. This is released under the GNU Free Documentation License - its text is provided in the LICENSE file. This repository is also mirrored on NotABug - a fully-free (as in libre) alternative to Github. Preference is given to free software and sellers who aren’t evil for physical resources. Open Music - a visual programming, computer-aided composition environment. GPL3. OM7 - a new implementation of the OpenMusic visual programming and computer-aided composition environment including a number of improvements on graphical interface, computational mode, and connection to external software libraries. GPL3. cl-supercollider - A SuperCollider client for CommonLisp. With a tutorial and live coding demos. Public domain. csound - A sound and music computing system. Includes CFFI and FFI interfaces for Common Lisp. CLM - Common Lisp Music is a music synthesis and signal processing package in the Music V family. It provides much the same functionality as Stk, Csound, SuperCollider, PD, CMix, cmusic, and Arctic — a collection of functions that create and manipulate sounds, aimed primarily at composers (in CLM’s case anyway). cl-patterns - a system for composing music via Lisp code, heavily inspired by SuperCollider’s patterns system, with aims to implement much of it, but in a more robust, expressive, consistent, reflective, and lispy way. cl-openal - bindings for the OpenAL audio library. Public domain. cm-incudine - extends Common Music 2 with realtime capabilities. GPL2. Mégra - A mini-language to make music with variable-order markov chains and some other stochastic shenanigans. GPL3. Music - A framework for musical expression in Lisp with a focus on music theory (built from scratch, unrelated to Common Music). rq - A library for rhythm transcription in OpenMusic (version 6.10 and later). demo video. GPL3. scheduler - The time based musical event scheduler for Common Lisp. Apache2.0. mixalot - Loosely-coupled collection of audio libraries for mp3, ogg vorbis, flac. Used for the Shuffletron music player. osc - an implementation of the Open Sound Protocol. LGPL2.1. Harmony - A real-time sound processing and playback system. Artistic License 2.0.
:star: ASDF - Another System Definition Facility; a build system for Common Lisp. Expat. asdf-linguist - Extensions for ASDF. Expat. asdf-viz - a tool to visualize the library dependencies of ASDF systems, the call graph of a function and the class inheritances. LLGPL. cmacro - Lisp macros for C. MIT. C-mera - a source-to-source compiler that utilizes Lisp’s macro system for meta programming of C-like languages. GPL3. lispc - a powerful “lispsy” macrolanguage for C. MIT. :star: Ironclad - A library of crypto functions for Common Lisp. Not considered secure, but is still useful for the message digest functions. Expat. crypto-shortcuts - Collection of common crypto shortcuts. Artistic License 2.0.
trivial-ssh - An SSH client library. Expat. cl-monero-tools - Common Lisp toolbox to work with the Monero cryptocurrency. GPL3. Not in Quicklisp. emotiq - a next-generation blockchain with an innovative natural-language approach to smart contracts. MIT. peercoin-blockchain-parser - parse the blockchain contained in a file and export some of its data to a text file, a SQL script or a database. It can also create a database using the RPC of a Peercoin daemon as source of data instead of a blockchain file. LGPL3. Not in Quicklisp. peercoin-calculator - This program gives you the probability of generating a POS or POW block within 10 minutes, 24 hours, 31 days, 90 days and 1 year, as well as the reward that can be expected. GUI in Qt. GPL3. Not in Quicklisp. peercoin-vote - A voting system based on data from the blockchain (addresses and balances). GPL3. Not in Quicklisp. :star: clsql - An SQL database with a Common Lisp interface. LLGPL. 👍 mito - An ORM for Common Lisp with migrations, relationships and PostgreSQL support LLGPL. mitho-auth, a mixin class for use authorization; mito-attachment, a mixin class for file management outside of RDBMS. cl-dbi - A database-independent interface for Common Lisp. LLGPL. crane - Another ORM. Expat. datafly - A lightweight database library. 3-clause BSD. sxql - A DSL for generating SQL. 3-clause BSD. elephant - Elephant is a persistent object database for Common Lisp with full transaction semantics. LLGPL. ubiquitous - A library providing easy-to-use persistent configuration storage. Artistic License 2.0.
:star: postmodern - A library for interacting with PostgreSQL. zlib. cl-sqlite - Bindings for SQLite. Public domain. cl-memcached - Fast, thread-safe interface to the Memcached object caching system. Expat. cl-mongo - MongoDB client. Expat. cl-redis - Redis client. Expat. cl-disque - Disque client. 3-clause BSD. cl-rethinkdb - RethinkDB client. Expat. clouchdb - Library for interacting with CouchDB. FreeBSD. dyna - an AWS DynamoDB ORM. MIT. cl-influxdb - an interface to the Time Series Database InfluxDB. MIT. pgloader - a data loading tool for PostgreSQL. PostgreSQL Licence. 👍 FSet - A functional, set-theoretic collections data structure library. LLGPL. bst - Binary Search Tree. GPL3. Not in Quicklisp. pileup - a portable, performant, and thread-safe binary heap for Common Lisp. MIT. sycamore - a fast, purely functional data structure library. BSD_3Clause. genhash – hash table implementation with API from generic methods. Public domain. cl-ctrie - lock-free, concurrent, key/value index with efficient memory-mapped persistence and fast transient storage models. MIT. cl-data-structures - a portable collection of data structures and algorithms (mainly dicts and sequences, with some statistical functions). BSD. and see more on Quickdocs. :star: CFFI - Portable, easy-to-use C foreign function interface. Expat. 👍cl-autowrap - Automatically parses header files into CFFI definitions. FreeBSD. cl+j - A JNI-based interface to a JVM via CFFI. Not available on Quicklisp. Does not reliably work with all implementations. Expat. Foil - A foreign object interface; works with the JVM and CLI. Not available on Quicklisp. CPL 1.0.
objc-lisp-bridge - A portable reader and bridge for interacting with Objective-C and Cocoa. MIT. burgled-batteries - A bridge between Python and Common Lisp. Not available on Quicklisp. No license specified. Xelf - Extensible game library. Not available on Quicklisp. GNU LGPL2.1. Trial - Trial is an OpenGL game engine with a heavy focus on modularity. It is supposed to provide a large toolkit of useful bits and pieces from which you can create a game. Artistic License 2.0.
cl-mpg123 and cl-out123, bindings libraries for libmpg123 and libout123 respectively, giving you fast and easy to use mp3 decoding and cross-platform audio output. Artistic License 2.0.
trivial-gamekit – with this small framework you would be able to make simple 2D games: draw basic geometric forms, images and text, play sounds and listen to mouse and keyboard input. cl-gamepad - Access to gamepads and joysticks on Windows, Mac OS, and Linux. Artistic License 2.0. These are libraries for working with graphics, rather than making GUIs (i.e. widget toolkits), which have their own section. :star: Sketch - A CL framework for the creation of electronic art, graphics, and lots more. MIT. common-cv - the OpenCV (Open Source Computer Vision Library) binding library for CommonLisp. No license specified. cl-gd - A library providing an interface to the GD graphics library. FreeBSD. cl-opengl - CFFI bindings to OpenGL, GLU and GLUT APIs. 3-clause BSD. cl-sdl2 - Bindings for SDL2 using C2FFI. Expat. cl-svg - A basic library for producing SVG files. Expat. CLinch - Common Lisp 2D/3D graphics engine for OpenGL. FreeBSD. donuts - Graph drawing DSL for Common Lisp. Expat. dufy - exact color manipulation and conversion in various color models. MIT. lispbuilder-sdl - A set of bindings for SDL. Expat. lisp-magick-wand - ImageMagick bindings. BSD. Not in Quicklisp. okra - CFFI bindings to Ogre. Not available on Quicklisp. 3-clause BSD. opticl - a library for representing and processing images. BSD_2Clause. Varjo - Lisp to GLSL translator. BSD_2Clause. Vecto - Simple vector drawing library. FreeBSD. zpng - A library for creating PNG files. FreeBSD. 👍 Qtools - A Qt toolkit, based on CommonQt. Artistic License 2.0 Also Qtools-ui (premade UI components), with videos. :star: CommonQt - A Common Lisp binding for Qt4 via QtSmoke. FreeBSD. :star: ltk - A binding for the Tk toolkit. LLGPL or GNU LGPL2.1. nodgui - Bindings for the Tk toolkit, based on Ltk, with syntax sugar and additional widgets. LLGPL. cl-cffi-gtk - Binding for GTK+3. GNU LGPL2.1. cl-gtk2 - A binding for GTK+2. LLGPL. ceramic - Desktop web apps with Electron. Expat. CocoaInterface - Cocoa interface for Clozure Common Lisp. Build Cocoa user interface windows dynamically using Lisp code and bypass the typical Xcode processes. It has good documentation and a tutorial. McCLIM - An implementation of the Common Lisp Interface Manager, version II. GNU LGPL2.1. cl-webkit - A binding to WebKitGTK+. Also adds web browsing capabilities to an application, leveraging the full power of the WebKit browsing engine. MIT. ftw - A Win32 GUI library. MIT. cl-xul - Mozilla XUL bindings. Expat. eql, eql5, eql5-android - Embedded Qt4 and Qt5 Lisp, embedded in ECL, embeddable in Qt. Port of EQL5 to the Android platform. MIT. :star: SBCL - A fork of CMUCL; compiles to machine code. Standard compliance. Public domain, with some parts under Expat and 3-clause BSD. :star: CCL - Clozure Common Lisp; compiler-only implementation, generates native code. LLGPL. ECL - Embeddable Common Lisp; compiles to C. GNU LGPL2.1. ABCL - Armed Bear Common Lisp; targets the JVM, compiles to bytecode. Standard conformance. GNU GPL3 with Classpath exception. CMUCL - An implementation from Carnegie Mellon University. Public domain. GNU CLISP - A GNU implementation; contains a compiler and an interpreter. Standard conformance. GNU GPL3. CLASP - a new Common Lisp implementation that seamlessly interoperates with C++ libraries and programs using LLVM for compilation to native code. This allows Clasp to take advantage of a vast array of preexisting libraries and programs, such as out of the scientific computing ecosystem. LGPL2.1 (and others). Corman Lisp - a Common Lisp development environment for Microsoft Windows running on Intel platforms. MIT. Lispworks - an integrated cross-platform development tool for Common Lisp. Allegro CL - provides the full ANSI Common Lisp standard with many extensions. MOCL - CL as a library for mobile devices (iOS & Android) and OSX. cl-json - A JSON encoder and decoder. Expat. jsown - A reader and writer for the JSON format. Expat. json-mop - A metaclass for bridging CLOS and JSON objects. MIT. See also this extensive comparison of JSON libraries. cl-yacclyaml - a pure lisp YAML processor (loader, but not yet dumper). GPL3. cl-yaml - a YAML parser and emitter built on top of libyaml. MIT. cl21 - An experimental project to move Common Lisp into the 21st century. Expat. :star: alexandria - A general-purpose utility library. Public domain. serapeum - Another general-purpose utility library. Expat. anaphora - A collection of anaphoric macros. Public domain. cl-algebraic-data-type - A library for defining algebraic data types in a similar spirit to Haskell or ML. 3-clause BSD. :star: optima - Optimized pattern-matching library. LLGPL. str - a modern, simple and consistent string manipulation library. MIT. trivial-types - Trivial type definitions. LLGPL. interface - A protocol library. 3-clause BSD. cl-syntax - Reader syntax conventions. LLGPL. cl-2dsyntax - An indentation-sensitive reader system. Not available on Quicklisp. No license specified. cl-annot - Python-like annotations for Common Lisp. LLGPL. :star: cl-interpol - A set of reader modifications to allow string interpolation. No license specified. arrow-macros - Clojure-like threading macros. MIT. dissect - when a lot of projects use the “trivial-backtrace” system that just gives them a string with a backtrace, Dissect allows you to capture, step, and completely inspect the stack trace on a variety of Lisp implementations. Also very useful for logging and other situations where execution is automatically continued, but the information of the current stack is still useful to store somewhere. Artistic License 2.0.
clamp - Arc language’s brevity and conciseness to Common Lisp. Artistic License 2.0.
trivial-arguments - A portable library to retrieve the arguments list of a function. Artistic License 2.0.
modf - a setf-like macro for functional programming. generic-cl - Generic function interface to standard Common Lisp functions (equality, comparison, arithmetic, objects, iterator, sequences,…). MIT. pythonic-string-reader - A simple and unobtrusive read table modification inspired by Python’s three quote strings. BSD_3Clause. :star: closer-mop - A compatibility layer that rectifies many absent or incorrect MOP features. Expat. defclass-std - a shortcut macro to write DEFCLASS forms quickly. LLGPL. :star: iterate - An iteration construct for Common Lisp which is extensible and Lispier. No license specified. for - A concise, lispy and extensible iteration macro. Unlike loop it is extensible and sensible, and unlike iterate it does not require code-walking and is easier to extend. Artistic License 2.0.
series - Functional style without any runtime penalty at all. MIT. fn - a couple of lambda shorthand macros. (fn* (+ _ _)) --> (lambda (_) (+ _ _)). Public domain. f-underscore - a tiny library of functional programming utils. (f_ (+ _ _)) -> (lambda (_) (+ _ _)). Public domain. cl-chump - Scala-like anonymous lambda literals. (mapcar ^(* 2 _) '(1 2 3 4 5)). MIT. See also CL21 and Rutils. cl-prolog2 - Common Interface to ISO Prolog implementations from Common Lisp. MIT. Screamer - augment Common Lisp with practically all of the functionality of both Prolog and constraint logic programming languages. Blog post solving Project Euler puzzles. MIT. Screamer+ - increasing the expressiveness of SCREAMER. MIT. Temperance - logic programming. MIT. A focus on performance, with General Game Playing in mind. Cells - an implementation of the dataflow programming paradigm, reactive spreadsheet-like expressiveness for CLOS. Used to build an algebra learning system. With documentation. Lisp LGPL. quid-pro-quo - a contract programming library in the style of Eiffel’s Design by Contract ™. Public domain. Learn X in Y minutes - Where X = Common Lisp - Small Common Lisp tutorial covering the essentials. Common LISP: A Gentle Introduction to Symbolic Computation - A nice introduction into the language. Learn LISP: Simply Easy Learning - A good set of introductory tutorials; includes interactive examples. Successful Lisp - A good book for beginners with some programming background. Common Lisp Koans - The project guides the learner progressively through many Common Lisp language features. Lisp Quickstart - A good tutorial to get up and code Common Lisp quickly. Casting SPELs in LISP - A fun way to learn LISP while reading a comic book. Common Lisp tips - A blog with useful tips and tricks. CommonQt tutorial - A nice introduction to CommonQt. A tutorial for creating and publishing open-source Common Lisp software - A handy tutorial for using Quicklisp and a bunch of other tools to create and publish a project in Common Lisp. Let Over Lambda - A book on advanced macro techniques. The first six chapters are available online. On Lisp - Paul Graham’s amazing book on Lisp macros (and other interesting things). Common Lisp Quick Reference - A distilled, pocket-size version of the ANSI CL spec. Available for download as a PDF. CLHS - The Common Lisp HyperSpec; the ANSI CL standard, in hypertext form. Common Lisp Standard Draft - The final draft of the Common Lisp specifications, in a well formatted PDF. Common Lisp the Language - The original standard for Common Lisp before the ANSI spec. Minispec - A friendlier, but less-complete, version of CLHS. Also contains documentation for some commonly-used CL libraries (such as Alexandria). Simplified Common Lisp reference - The simplified version of CLHS. Quickdocs - A reference for the libraries provided by Quicklisp. Land of Lisp - A fun, game-oriented introduction to Common Lisp. Practical Common Lisp - A good introductory text to Common Lisp, with practical examples. ANSI Common Lisp - A thorough, practical covering of the entire language, with exercises. Not recommended as a starter text, due to some caveats. Common Lisp Recipes - Common Lisp Recipes is a collection of solutions to problems and answers to questions you are likely to encounter when writing real-world applications in Common Lisp. Published in 2015. Let Over Lambda - A book on advanced macro techniques. All eight chapters are available in the print copy. Object-Oriented Programming in Common Lisp: A Programmer’s Guide to CLOS - An old, but very thorough book on CLOS. Paradigms of Artificial Intelligence Programming: Case Studies in Common Lisp - A book on programming AI that covers some advanced Lisp. #lisp on Freenode - main Common Lisp IRC channel. Planet List - A meta blog that collects the contents of various Lisp-related blogs. :star: Quicklisp - A library manager containing many libraries, with easy depencency management. Expat. Ultralisp - A Quicklisp distribution which updates every 5 minutes and to which one can add his project in one click. BSD. Quicksys - install systems from multiple Quicklisp distributions. MIT. 👍Roswell - a Lisp implementation installer, script launcher and more. MIT. qlot - A project-local library installer, similar to Bundler or Carton. Expat. Quickutil - A utility manager, similar to Quicklisp, but for small utilities rather than whole libraries. 3-clause BSD. Qi - A package manager with a traditionnal approach. BSD. print-licenses - print licenses used by a project and its dependencies. MIT. cl-brewer - Homebrew formula builder for (command line) common lisp applications. Public domain. qldeb - Quicklisp systems to debian packages, along with deb-packager (simply create a debian package by defining an s-expression) and an introductory blog post. Both MIT. ql-to-deb - Update cl-* debian packages from Quicklisp releases. WTFPL. clml - originally developped by Mathematicl Systems Inc., a Japanese company. With a tutorial. LLGPL. mgl - used by its author to win the Higgs Boson Machine Learning Challenge. MIT. antik - a foundation for scientific and engineering computation in Common Lisp. GPL. Also mgl-mat and LLA. Credit: borretti.me’ state of CL ecosystem 2015.
cl-nlp - Natural language processing toolset. Apache2.0. babel2 - A Fluid Construction Grammar implementation, computational framework, and unification-based grammar formalism Apache2.0. sparser - A natural language understanding system for English. Eclipse. 👍 Dexador - An HTTP client, that aims at replacing Drakma. MIT. Carrier - A lightweight, async HTTP client built on top of cl-async and fast-http. MIT. fast-http - A fast HTTP request/response parser for Common Lisp. MIT. 👍Clack - A web application environment inspired by Rack and WSGI. LLGPL. Provides a unified interface to a webserver of choice (default is Hunchentoot). aserve - AllegroServe; a web server. LLGPL. wookie - Asynchronous HTTP server. Expat. woo - A fast non-blocking HTTP server on top of libev. MIT. clack-errors - Error page middleware for Clack. LLGPL. clath - a single sign-on middleware for Clack. It allows basic login with OAuth1.0a, OAuth2 and OpenID. At the time of writing, it supports authentication from Google, Twitter, LinkedIn, StackExchange, Reddit and Github. Apache2.0. clack-pretend - a testing and debugging tool for clack. Apache2.0. hermetic - Security for Clack-based web applications. Expat. live-reload - Live reload prototype for clack. LLGPL. clack-static-asset-middleware - a cache-busting static asset middleware for the clack. MIT. hh-web - Framework for building modern web apps. Expat. ningle - A super-micro web framework. LLGPL. ninglex, an extended and noob-friendly ningle (mostly easier handling of query parameters). MIT. radiance - A web application environment and framework . Artistic License 2.0. Lucerne - A minimal web framework built on Clack, inspired by Flask. MIT. Snooze - A RESTful web framework, built on Clack, where routes are just functions and HTTP conditions are just Lisp conditions. LLGPL. cl-rest-server - a library for writing REST web APIs. Features validation with schemas, annotations for logging, caching, permissions or authentication, documentation via Swagger, etc. MIT. There are more projects, more or less discontinued but interesting. See the other ressources. Rock - an asset manager for Common Lisp. It’s basically a combination of Bower and webassets. MIT. 👍 Plump - A lenient HTML/XML parser, tolerant on malformed markup. Artistic License 2.0. Best used with lquery and clss. 👍 lquery - A jQuery-like HTML/DOM manipulation library. Artistic License 2.0. See also the XML section below for xpath libraries and more. 👍 spinneret - Common Lisp HTML5 generator. Expat. flute - An easily composable HTML5 generation library with the most simplistic syntax. MIT. :star: cl-who - The venerable HTML generator. FreeBSD. :star: Djula - A port of Django’s template engine to Common Lisp. Expat. cl-markup - Modern markup generation library. LLGPL. eco - Fast, flexible, designer-friendly template engine. Expat. cl-closure-template - Implementation of Google’s Closure templates. LLGPL. clip - An HTML template processor where the templates are written in HTML. Artistic License 2.0.
quri - Another URI library for Common Lisp. Supports userinfo, IPv6 hostname, encoding/decoding utilities,… BSD_3Clause. purl - Provides a parser and defines a type for URLs as specified in RFC1738. GNU GPL3. cl-slug - a small library to make slugs, mainly for URIs, transform in CamelCase, remove accentuation and punctuation, for english and beyound. LLGPL. parse-js - A package for parsing ECMAScript 3. zlib. JSCL - A CL-to-JS compiler designed to be self-hosting from day one. Lacks CLOS, format and loop. Wuwei - A toolkit to build Ajax-based web pages. MIT. Panic, a Parenscript library for React. Not in Quicklisp. MIT. Its TodoMVC example. See also trident-mode, an Emacs minor mode for live Parenscript interaction. trivial-imap - tries to make easy some common cases of working with IMAP servers, like reading emails from the server. A thin wrapper over post-office library (which is a fork of Franz’s cl-imap). BSD. mailgun - A thin wrapper to post HTML emails through mailgun.com. No license specified. mito-email-auth - Helper to authenticate a website’s users by sending them unique code by email. 👍 usocket - A portable TCP and UDP socket interface. Expat. websocket-driver - a WebSocket server/client implementation, backend agnostic (Clack). 3-clause BSD. 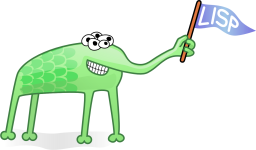 coleslaw and its coleslaw-cli - Flexible Lisp Blogware similar to Frog, Jekyll, or Hakyll. BSD. heroku-buildpack-common-lisp - A Heroku buildpack that uses Roswell to compile Common Lisp applications. LGPL3. cube - Kubernetes client library for Common LISP generated from the Swagger specification. No license specified. base-lisp-image - base Docker image for Common Lisp projects with SBCL or CCL and the latest ASDF, Qlot and Roswell. deploy - A toolkit for binary deployment of Lisp applications, with extra support for foreign shared libraries. Artistic License 2.0.
cl-aws-runtime-test - An example of using Common Lisp (SBCL) as a custom runtime on AWS lambda. WTFPL. See also Heliohost for a free hosting solution. prometheus.cl - Prometheus.io client. Grafana dashboard for SBCL and Hunchentoot metrics (memory, threads, requests per second,…). MIT. Aws-sign4 - Common Lisp library for Amazon Web Services signing version 4. GNU GPL3. zs3 - A library for working with Amazon’s Simple Storage Service (S3) and CloudFront service. BSD. cl-ses - Library for AWS SES. Expat. north - The successor to the South (Simple OaUTH) library, implementing the full oAuth 1.0a protocol, both client and server sides. Using North you can easily become an oAuth provider or consumer. Artistic License 2.0.
avatar-api - Get avatars from Google+, Gravatar and others. Expat. chirp - A Twitter client library. Artistic License 2.0.
tooter - a client library implementing the full v1 REST API protocol for Mastodon. ArtisticLicense2.0. cl-irc - An IRC client library. Expat. cl-mediawiki - a wrapper around the MediaWiki api. MIT. cl-openid - An implementation of OpenID. LLGPL. cl-pushover - Common Lisp bindings to Pushover. MIT. humbler - A Tumblr API interface. Artistic License 2.0. *multiposter - post to multiple services simultaneously. stripe-client - a client for the Stripe payment system. MIT. maiden - A bot and chat system framework with support for IRC and more. Artistic License 2.0.
css-lite - A CSS grammar. Expat. find-port - Programmatically find open ports. MIT. cl-forms - Web forms handling library for Common lisp. MIT. Postmaster - A simple, easy-to-use SMTP/IMAP library. Expat. cl-selenium-webdriver - a binding library to Selenium 2.0.
magicl - Matrix Algebra proGrams In Common Lisp based on BLAS/LAPACK and Expokit, by Rigetti Computing. BSD_3Clause. cl-spark - Generates sparkline strings for lists of numbers. Expat. GSLL - GNU Scientific Library for Lisp; allows the use of the GSL from Common Lisp. GNU LGPL2.1. common-lisp-stat - Common Lisp statistics library. FreeBSD. maxima - Computer algebra system. Not available on Quicklisp. GNU GPL3. lisp-matrix - A matrix package. FreeBSD. 3-matrices - A library implementing common matrix calculations, with an emphasis on 2x2,3x3, and 4x4 matrices as commonly used in graphics. It provides some numerical functions as well, but those are not the focus. The library is heavily optimised, so it is not made of pretty code. Artistic License 2.0. Xecto - A library for regular array parallelism. 3-clause BSD. Petalisp - an attempt to generate high performance code for parallel computers by JIT-compiling array definitions. It works on a more fundamental level than NumPy, by providing even more powerful N-dimensional arrays, but just a few building blocks for working on them. AGPL. :star: BordeauxThreads - Portable, shared-state concurrency. Expat. :star: lparallel - A library for parallel programming. 3-clause BSD. chanl - Portable, channel-based concurrency. Expat, with parts under 3-clause BSD. cl-async - A library for general-purpose, non-blocking programming. Expat. erlangen - Distributed, asynchronous message passing system for Clozure Common Lisp. GNU GPL3. See also the Actors package for LispWorks (discussion) MIT. Moira - Monitor and restart background threads. In-lisp process supervisor. No license specified. trivial-monitored-thread - a Common Lisp library offering a way of spawning threads and being informed when one any of them crash and die. MIT. simple-tasks - A very simple task scheduling framework. Artistic License 2.0.
deeds - Deeds is an Extensible Event Delivery System. It allows for efficient event delivery to multiple handlers with a complex event filtering system. Artistic License 2.0.
cl-flow - Data-flowish computation tree library for non-blocking concurrent Common Lisp. MIT. event-glue - simple eventing abstraction. No dependencies. It can be used anywhere you need a generic event handling system. MIT. psychiq - redis-based background job processing for Common Lisp applications. Inspired by Ruby’s Sidekiq and compatible with its web UI. LLGPL. clerk - a cron-like scheduler with sane DSL. MIT. :star: cl-ppcre - Portable, Perl-compatible regular expressions. FreeBSD. 👍 Roswell - a lisp installer and scripting environment (helper, launcher, installer) and more. MIT. Shelly - execute Common Lisp functions like a shell command, without the need to write a command line arguments parser. And it also can be used as a Make-like build-tool. FreeBSD. cl-readline - a set of functions to edit lines as they are typed in, to maintain a list of previously-entered command lines, to recall and reedit them and perform csh-like history expansion. Emacs and vi editing modes. GPL3. 👍 Unix-opts - a command line options parser with a concise declaration of options. MIT. CLON - Command Line Options Nuker. ISC. cl-ansi-term - print colorized text, horizontal lines, progress bars, (un)ordered lists and tables on ANSI-compliant terminals. GPL3. cl-charms - an interface to libcurses in Common Lisp. It provides both a raw, low-level interface to libcurses via CFFI, and a more higher-level lispier interface. MIT. shcl - a POSIX-like shell in Common Lisp. Apache2.0. cl-progress-bar - progress bars, just like in Quicklisp ! MIT. WCL - allow hundreds of Lisp applications to be realistically available at once, while allowing several of them to run concurrently. WCL accomplishes this by providing Common Lisp as a Unix shared library that can be linked with Lisp and C code to produce efficient applications. For example, the executable for a Lisp version of the canonical Hello World! program requires only 20k bytes on 32 bit x86 Linux. WCL also supports a full development environment, including dynamic file loading and debugging. A modified version of GDB is used to debug WCL programs, providing support for mixed language debugging. With a paper. replic - helpers to turn existing code into a readline application, with a focus on defining the completion of the commands’ arguments. Also comes as a ready to use executable, that transforms a user’s lispy init file into readline commands. MIT. cl-all - A script to run Lisp snippets in multiple implementations. This allows you to quickly compare implementation behaviour and differences. Artistic License 2.0. This contains plugins and other goodies for various text editors. Parinfer - Parinfer is a way to edit lisp code that helps to keep both the indentation and the parenthesis balanced. It is easy to start with and yet it offers advanced features à la Paredit. It is available on many editors (Emacs, Vim, Neovim, Atom, Sublime Text, Visual Studio Code, LightTable, CodeMirror,…). :star: Slime - Superior Lisp Interaction Mode for Emacs; a full-blown environment for Common Lisp inside of Emacs. Public domain. 👍 Sly - SLY is a fork of SLIME and contains multiple improvements upon it. 👍 Portacle - A portable and multiplatform Common Lisp environment: SBCL, Quicklisp, Emacs, Slime, Git. cl-devel2 - a Docker container for Common Lisp development environment. Ships SBCL, CCL, Roswell and Emacs25 with Slime. SLIMV - Superior Lisp Interaction Mode for Vim; a full-blown environment for Common Lisp inside of Vim. No license specified. Vlime - VLIME: Vim plus Lisp Is Mostly Evil. A Common Lisp dev environment for Vim (and Neovim). MIT. quicklisp.nvim - A Quicklisp frontend for Neovim. Slimv_box - slimv in a Docker container. Dandelion - a Common Lisp plugin for the Eclipse IDE. Lem - a ready to use, Emacs-like, Slime-based editor tailored for Common Lisp development. Ncurses and Electron interfaces. MIT. An opengl frontend. SLIMA allows you to interactively develop Common Lisp code, turning Atom into a pretty good, and actively developped, Lisp IDE. MIT. Sublime Text has Common Lisp support with its “SublimeREPL” package. [Proprietary]. cl-jupyter - A Common Lisp kernel for Jupyter notebooks custom licence. common-lisp-jupyter - A Common Lisp kernel for Jupyter along with a library for building Jupyter kernels, based on Maxima-Jupyter by Robert Dodier which was based on cl-jupyter by Frederic Peschanski. MIT. Darkmatter - A notebook-style Common Lisp environment. MIT. cl-repl - an ipython-like REPL. With completion, shell commands, magic commands, debugger, etc. MIT. With colorthemes. montezuma - Full-text indexing and search for Common Lisp. Expat. mk-string-metrics - Calculate various string metrics efficiently in Common Lisp (Damerau-Levenshtein, Hamming, Jaro, Jaro-Winkler, Levenshtein, etc). MIT. cl-yacc - a LALR(1) parser generator. MIT. wiki-lang-detect - Text language identification using Wikipedia data. No license specified. These are applications or bits of code that make development in Common Lisp easier without being Common Lisp libraries themselves. quickapp - A project for generating template projects with SBCL and buildapp. Also includes a command-line argparser. 3-clause BSD. quickapp-cli - quickapp as a command-line utility. 3-clause BSD. quicksearch - Look up online libraries from the REPL. Expat. SWIG - A tool for generating FFI code from C/C++ header files. GNU GPL3. cl-project - General modern project skeletons. LLGPL. lake - a GNU make like build utility. MIT. :star: FiveAM - Simple regression testing framework. FreeBSD. CLUnit - A unit testing library. Expat. Rove - Rove is a unit testing framework for Common Lisp applications. It is intended to be a successor of Prove. 3-clause BSD. Parachute - An extensible and cross-compatible testing framework. With test dependencies, conditions, fixtures and restarts. Artistic License 2.0. Mockingbird - A small stubbing and mocking library for Common Lisp. Can also check wether a stubbed function was called, how many times and with which arguments. MIT. Check-it - A QuickCheck-style randomized property-based testing. LLGPL. cl-coveralls - a helper library to post test coverage to Coveralls. See continuous-integration on lisp-lang.org and SBCL’s code coverage tool. FreeBSD. clache - General caching facility. No license specified. 👍 py-configparser - reads and writes Python’s ConfigParser-like configuration files. MIT. envy - Configuration switcher. FreeBSD. cl-csv - A library for parsing CSV files. 3-clause BSD. cl-decimals - Decimal number parser and formatter. Public domain. auto-text - automatic (encoding, end of line, column width, csv delimiter etc) detection for text files. MIT. See also inquisitor for detection of asian and far eastern languages. localtime - A development library for manipulating date and time information in a semi-standard manner. 3-clause BSD. cl-date-time-parser - Parse date-time-string, liberally. Hides the difference between date-time formats, and enables to manage date and time as the one date-time format. MIT. chronicity - A natural language date and time parse, to parse strings like “3 days from now”. BSD_3Clause. local-time-duration - Duration processing library built on top of local-time. MIT. iso-8601-date - Miscellaneous date routines in Common Lisp, based around the ISO 8601 string representation. LLGPL. ratify - A collection of utilities to ratify, validate and parse inputs. Artistic License 2.0.
clavier - General purpose validation library for Common Lisp. MIT. Codex - A beautiful documentation system for Common Lisp. MIT. Staple - a tool to generate documentation pages using an HTML template. Uses the existing README, adds docstrings, crossreferences and links to the CLHS. ArtisticLicense2.0. cl-bibtex - A compatible re-implementation of the BibTeX program in Common Lisp, with a BST-to-CL compiler. GNU LGPL2.1. :star: uiop and its pathname package (replaces cl-fad). uiop is part of ASDF3 and as thus is shipped in many implementations. MIT. osicat - A lightweight operating system interface on POSIX-like systems (directory iteration and deletion, environment variables, file permissions, etc) Expat. pathname-utils - A collection of utilities to help with pathname operations. Artistic License 2.0.
archive - a library for reading and creating archive (tar, cpio) files. BSD_3Clause. A pure Common Lisp replacement for the ‘tar’ program. legit - an interface to the Git binary. Artistic License 2.0.
cl-i18n - an i18n library. Load translations from GNU gettext text or binary files or from its native format. Localisation helpers of plural forms. LLGPL. cl-locale - A simple i18n library. LLGPL. enchant - bindings for the Enchant spell-checker library. Public domain. oxenfurt - A client library for the Oxford dictionary API. ArtisticLicense2.0. system-locale - A library to retrieve the user’s preferred language, so that your application may choose a sensible default. Artistic License 2.0.
multilang-documentation - Allows writing docstrings in multiple languages, for truly internationally documented libraries. Artistic License 2.0.
sblint - a linter for Common Lisp source code using SBCL, suited for Reviewdog (slides). BSD_2Clause. :star: log4cl - Logging framework modelled after Log4J. Apache2.0. Advanced integration with Slime. verbose - A fast and highly configurable logging framework. Artistic License 2.0.
cl-fluent-logger - A Common Lisp structured logger for Fluentd. 3bmd - a markdown -> html converter. MIT. cl-typesetting and cl-pdf - cross-platform Common Lisp libraries for generating PDF files. FreeBSD. cl-pslib - a (thin) wrapper around the pslib library for generating PostScript files. Also cl-pslib-barcode. LLGPL. vgplot - an interface to the gnuplot plotting utility with the intention to resemble some of the plot commands of octave or matlab. GPL3. This contains anything which doesn’t fit into another category. babel - A charset encoding/decoding library. Expat. chipz - A decompression library. 3-clause BSD. cl-cuda - A library to use NVIDIA CUDA in Common Lisp programs. LLGPL. corona - Create and manage virtual machines from Common Lisp http://eudoxia.me/corona MIT. :star: esrap - Packrat parser. Expat. fast-io - Fast octet-vector/stream I/O. 3-clause BSD. glyphs - A library for cutting down the verboseness of Common Lisp in places. GNU GPL3. iolib - I/O library. Expat. mixalot - A loosely-coupled collection of audio libraries. No license specified. named-readtables - Provides a readtable namespace, akin to package namespaces. 3-clause BSD. nEXT-Browser - A productivity focused, extensible/programmable web browser. 3-clause BSD. Salza2 - A library for creating compressed data. FreeBSD. simple-currency - A currency conversion library using daily information published by the ECB. FreeBSD. template - A library for templates and functions, similar to C++. 3-clause BSD. texp - A DSL to generate TeX. No license specified. trivial-benchmark - Tiny benchmarking library. Artistic Licence 2.0.
trivial-garbage - A portable finalizer, weak hash-table and weak pointer API. Public domain. trivial-utf8 - A small library for doing UTF-8-based I/O. Not available on Quicklisp. No license specified. CXML - XML parser, with a range of extension libraries. LLGPL. Plump - A lenient XML parser. Artistic License 2.0.
xpath (homepage - Implementation of the XML Path Language (XPath) Version 1.0. BSD_2Clause. s-xml - A basic parser. LLGPL. xmls - A small, simple, non-validating XML parser. 3-clause BSD. Your contributions are always welcome! Please submit a pull request or create an issue to add a new framework, library or software to the list. by default, add a library to the end of its section. absolute de-facto libraries, like BordeauxThreads or Quicklisp, should be denoted with a :star: (:star: in markdown). two libraries very similar in scope should be side by side, or in a section of their own. do some curation based on our experience and the state of the library’s documentation. We do not aim at listing every existing CL library (see Quickdocs or Cliki for that) nor to list every “popular” library (see Quicklisp stats). as such, the libraries we like best are marked with a 👍 (1F44D unicode character). See also the signs’ explanation in the introduction. awesome-cl is maintained by CodyReichert. This page was generated by GitHub Pages.